Mary Bennet, that plain, pedantic, priggish, middle sister from Jane Austen’s classic novel Pride and Prejudice, who gave us deadpan lines such as, “I admire the activity of your benevolence…but every impulse of feeling should be guided by reason; and, in my opinion, exertion should always be in proportion to what is required.” (Chapter 7), is explored in this new sequel by Patrice Sarath. How Mary could be made into a heroine the caliber of her elder sister Elizabeth, we shall soon discover. It’s been a year since the other Bennet daughters have married. Kitty has “come out” and will spend the summer with the Bingleys. Will “plain” Mary ever attract a suitor or just become an old maid? Jane and Lizzy plot to bring her to Pemberley for the summer to “improve” her. Lizzy tells Darcy of the plan: “You have the look of mischief about you,” Mr Darcy said. “Much as when we first met and exchanged words. Have I need to fear?” “Not at all” she said. “I merely came to warn you that I am my mother’s daughter after all. Jane and I are prepared to make a match for Mary.” (p. 9) However, has Mary already encountered a “match?” Perhaps…..
Poor Mary despairs of anyone ever sincerely paying attention to her. Prior to her Pemberley visit, she plays the pianoforte at a dance. Mary, who has zero experience with men, is asked to dance by a young gentleman named Tom Aikens. Ms. Sarath has brilliantly fashioned a most unforgettable and loveable hero, much in the mold of another popular hero nicknamed “Turnip,” in Lauren Willig’s Pink Carnation series. Mr. Aikens is everything Mary is not: vigorous, outgoing, brash, unkempt, unread, and most-often found on horseback. Shy, bookish Mary is a magnet to Mr. Aikens who pursues her from Pemberley to Rosings and back to Longbourn. But, is he destined to lose interest, due to her own self-doubting confusion over how he could possibly like her? The principals eventually all show up at Rosings: Mary, the Darcys (including Georgiana), the Collins’s and even Mr. and Mrs. Bennet arrive to deliver Mary’s trunk. Mary finally meets the enigmatic Anne. At first, Mary thinks Anne to be intellectually deficient. “Understanding pierced her and she felt a great and sudden sorrow. She had been right. Anne De Bourgh was simple, and all of Lady Catherine’s bluster, all of her posturing and praise on behalf of daughter, was to deny herself the knowledge.” (p. 85) It turns out that Anne is not all that simple but overly protected and sequestered away. Becoming friends, they improve each other to the point that Lady Catherine asks Mary to become Anne’s companion and stay at Rosings. But the grand lady continually seeks to discover a breech in Mary’s behavior that will bring social condemnation on the entire Bennet family. Alas, the inevitable blunder in propriety finally occurs. Will this end Mary’s friendship, destroy her budding self-esteem, banish her from Rosings and ostracize her from polite society forever? Further, there is an ironic and shocking surprise near the conclusion. I can explain my love for this story in a single word: AUTHENTICITY. Ms. Sarath faithfully renders all of our favorite P&P characters, vividly accentuates the dangerous social pitfalls for women of that time, and delivers the Regency style “lingo” that we all crave. In contrast to Miss Austen’s exquisitely long sentences is this author’s style which occasionally links a series of short sentences together which impart drama, action, and clarity to the story. The author also sprinkles gems of charming humor throughout, especially in Mary’s secret thoughts which show her innate intelligence, despite her lack of social awareness. Where Lizzy talks with complete candor, Mary converses politely and appropriately, but the author simultaneously reveals Mary’s very contrary private opinions which are highly amusing. 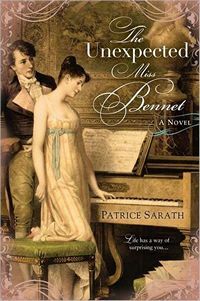 Author Patrice Sarath’s The Unexpected Miss Bennet, has cleaved me from my objectivity! Why? The story exactly and uncannily fulfills my daydreaming heart’s projected future for this most unappreciated and neglected Bennet sister. In the face of such a coincidental affirmation, how could I not pronounce this delightful little 224 page story one of the very best Austen sequels I have ever read? Yay for mary Bennet! Thanks for the great review. I will add this one to my wish list. It sounds like something I would really enjoy. What a great review! I can’t wait to read this, and Mary is not typically a favorite character of mine. I can’t wait to read this, it sounds great. I’m longing for something written a little closer to Austen’s style, and have always wanted to see Mary well taken care of. I’d not heard of this but will be ordering it as soon as the Christmas bills are paid! Thank you for your insightful appraisal of the book! Jeffrey thank you! I now have four books you have recommended recently: The Unexpected Miss Bennet, A Lady of Quality, Charity Girl, and, The Mischief of Mistletoe. You are most welcome, Beverley. It gives me the greatest pleasure to recommend something to read that I have likewise enjoyed. Stay tuned in because the grand hostess of Austenprose, Laurel Ann Nattress, plans to unveil her (and her reviewers’) top three favorite reads for 2011 sometime in early January….